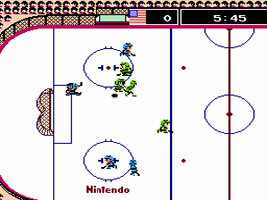 A NES Ice Hockey game. You control a team of five players as you gain possession of the puck and hit it into the goal net of your opponent. You only control one hockey player at a time, with the computer controlling the other four, but you switch to them automatically when they have possession of the puck. There are three body types for the players, determining whether they are standard, tricky or defensive players.